A week after the draft National Register of Citizens (NRC) was published, in which more than 40 lakh people were excluded, the Meghalaya police have stepped-up checks at its borders to stop “illegal foreigners”. L Syiem, the policeman in charge of a Meghalaya anti-infiltration outpost at Byrnihat on the Guwahati-Shillong route, and two of his associates whistle to flag down a passing sedan taxi. He asks the tourist family and the driver inside about where they have come from, requests for identification and peeps inside the car. Minutes later, he is satisfied and signals to the driver to go ahead. 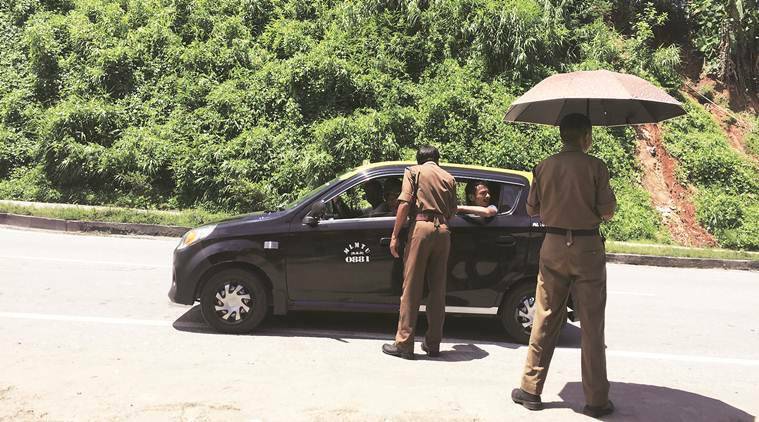 Syiem lets a few Assam-registered private cars go through after asking them to slow down but stops public vehicles and taxis on the highway that winds its way through the hills. Though officials said this process of checking of vehicles from Assam to track and “push-back” suspected “illegal foreigners” has been on for long, regular travellers told The Indian Express Monday that the intensity of checks on the highways have increased after the draft NRC was published. Now, they said, all travellers are asked to stop, while earlier, it was sporadic at best. According to Syiem, the police checked vehicles to prevent “illegal foreigners” from travelling to into Meghalaya. “This check-point is quite old and I have been posted here for the last six months. We often catch labourers without any documents and push them back into Assam, asking them to return with a valid document,” he said. He also said that on some inter-state routes, certain “non-government organisations” had tried setting up their own check posts and that had caused the controversy. Unhappy with the efficacy of at least seven anti-infiltration checkpoints on the various Assam-Meghalaya routes, the powerful Khasi Students’ Union (KSU) had set-up their own check posts, stopped travellers from Assam and questioned their identity just a day after the NRC draft was published on July 30. Donald Thabah, general secretary of the KSU, said that the union should get credit for the new improved checking initiative by the police on inter-state routes. “The checkposts have been there but they were understaffed and no personnel was doing any checking. It was only after our protests and setting up of independent check-gates that the government woke up and assured us that they will increase the checking,” he said. According to Thabah, Meghalaya Deputy Chief Minister Prestone Tynsong had assured the KSU that the vigil on the inter-state routes would be enhanced. He said that Meghalaya has a porous border with Bangladesh and since the adjacent state of Assam is carrying out the NRC exercise, it is important to carry out the checks on all routes. Dev also alleged in her letter the KSU were “doing the policing themselves and are also beating people up”. Videos circulating on social media showing vigilantes asking travellers in taxis to alight and show their documents. Superintendent of Police (infiltration), Debangshu Sangma, said that people travelling to Meghalaya will be checked for any valid document and that the anti-infiltration department has been doing it for a long time. Sangma clarified that police personnel are trained and will not harass travellers. “It is just that we will check everyone coming into Meghalaya and we will let them pass after they show any valid government-issued document, like ration card or driving license or anything. A dubious village head certificate will not do. And we are absolutely not asking whether a person’s name is in the NRC draft or not,” he said. Cachar SP Rakesh Roushan acknowledged that there was controversy after the anti-infiltration department of Meghalaya checked documents of people travelling to Meghalaya. “It’s all right now, no such complaints about harassment has been made to us,” he said. Incidentally, Assam Chief Minister Sarbananda Sonowal spoke to his Meghalaya counterpart Conrad Sangma on Saturday and requested him to take “urgent measures for ensuring smooth movement of people and vehicles of Assam passing through Meghalaya”. Police in both the states are also in touch to ensure no untoward incidents, a source said. The KSU, which had aborted their check posts after assurances from the government, said that they would “keep an eye on whether the personnel of the anti-infiltration department were doing their job properly or not”.